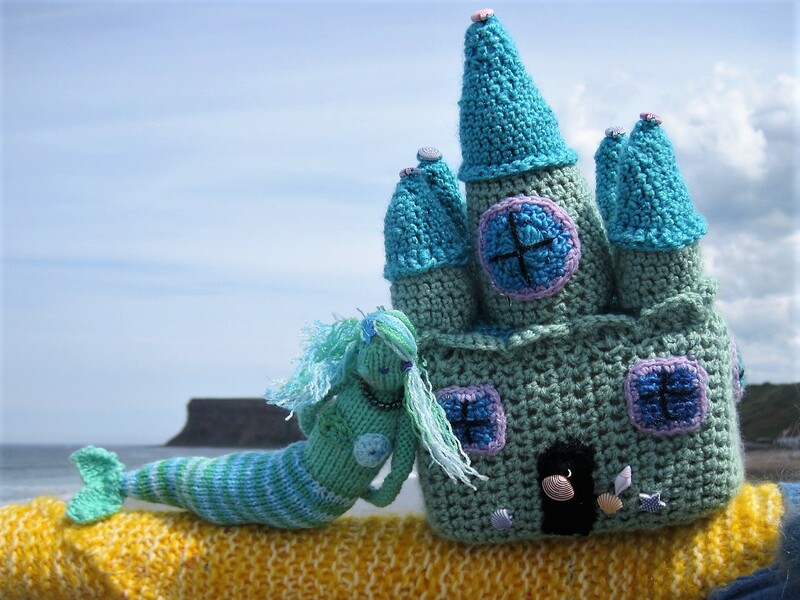 It wouldn’t be Summer without Saltburn! Awesome, aren’t they? Every year they pull it off! Recognise a few characters? Sorry I’ll not have much time to chat this weekend. We have a house viewing then we’re off up the coast to celebrate our anniversary. Don’t forget your Six Words, will you, and have a great weekend! See you Monday! Has anyone dropped a stitch lately? 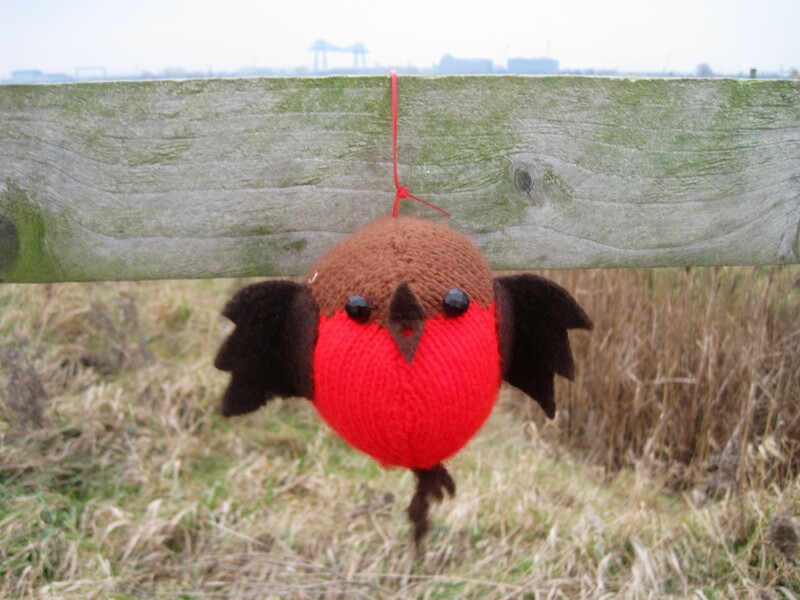 On the bleakest of Winter days, I still couldn’t resist a little yarn bombing, this time at Saltholme Nature Reserve. Not as pretty as me! An invite to an ugly bug ball? He’s always bad tempered, isn’t he, Mum? Let me round those sheep up! The details are amazing, aren’t they? I couldn’t see a dropped stitch anywhere. I had to keep on the move too, because it was SO cold! 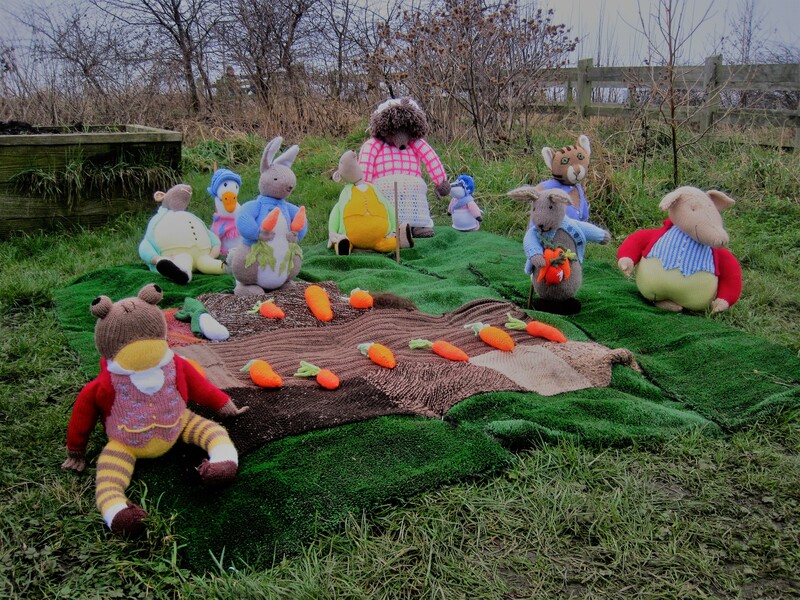 It wouldn’t be complete without a tea party, would it? (Hover over the smaller photos to see the captions, or click to view them in a gallery). Have a great weekend, whatever the weather, and don’t forget to join Debbie with six words. Goodbye to a worn out year! A chance remark gave me this week’s six words, but I do like to leave you with a smile. 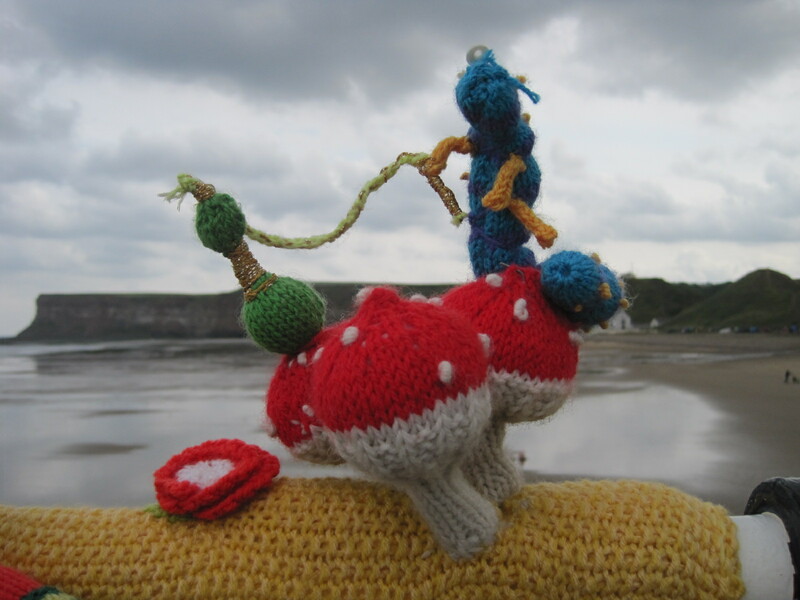 Remember my Monday walk, Yarn bombing in Yorkshire? 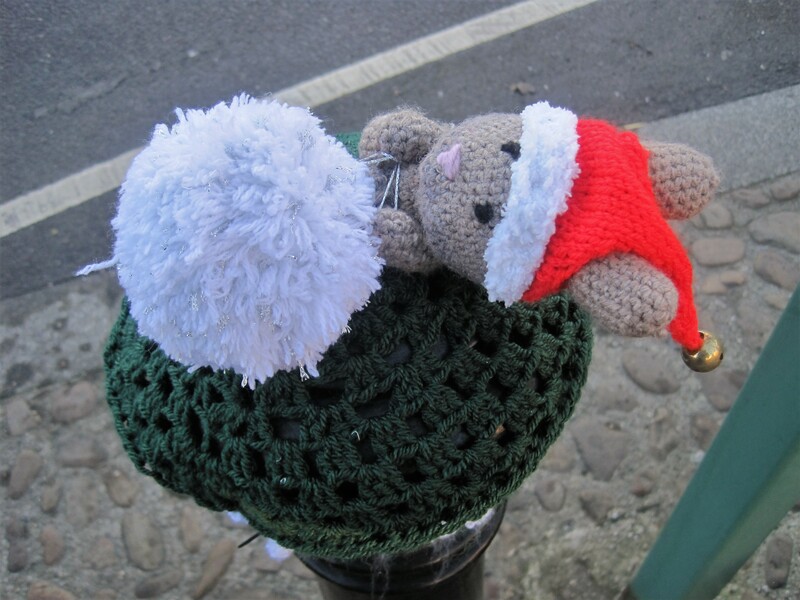 I had cause to return to Thirsk this week and what should I find in Market Square but these cheeky characters. 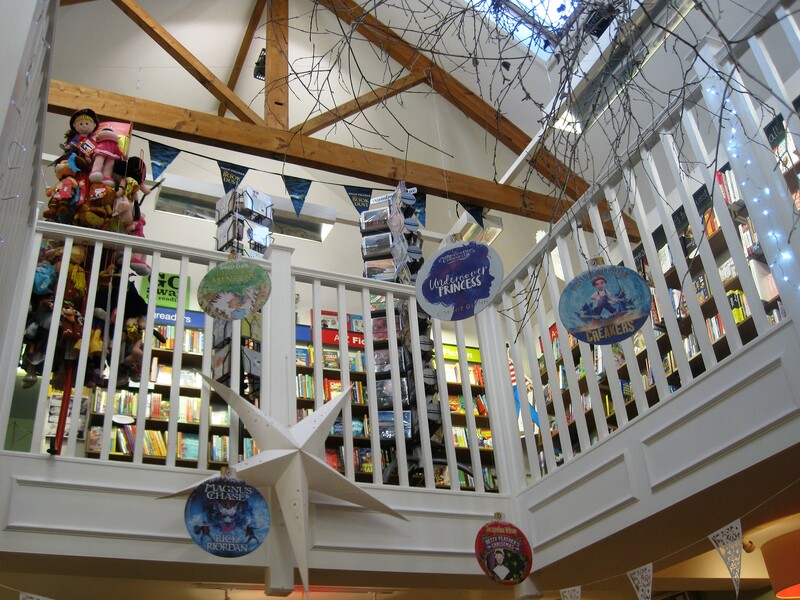 I walked past White Rose Book Cafe once, but I couldn’t walk past it twice. You’ll be expecting cake, but it was really cold and I had a warm cheese scone instead. Heaven! You’ll have to come back on Monday for cake, and then it’ll be a New Year. Thank you for sharing this one with me. In the book shop’s loo- nice! I know it’s been a bad year for some of you. We can only hope for better, can’t we? Wishing you, as I always do, good health and happiness in the year ahead. I hope to be in Norfolk with Polish family for New Year. Please snow, start thawing now. Over to Debbie for some magic! I do love a bit of enthusiasm, don’t you? 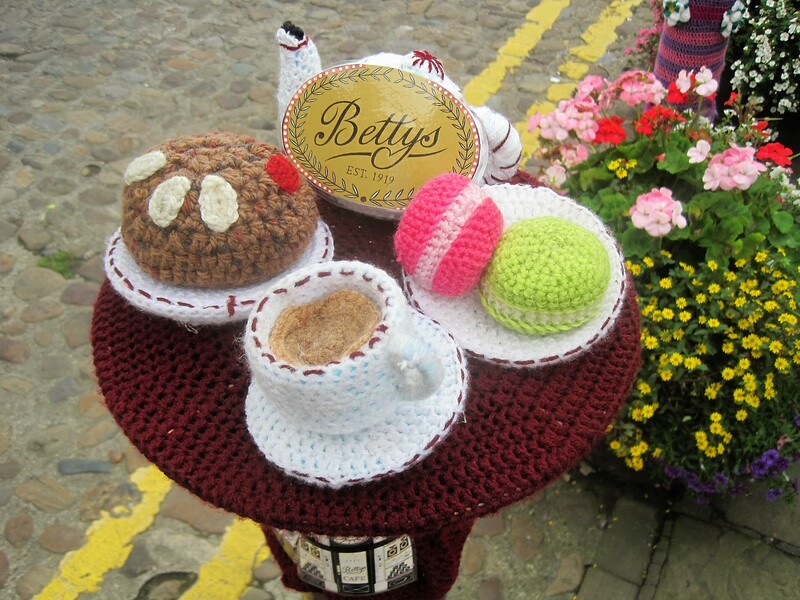 Last year, when the Tour de Yorkshire came to Thirsk, the celebrations included a colorful yarn bombing of the market square. Flushed with success, they did it all over again this year, for Yorkshire Day, on August 1st. In all honesty, I’d quite forgotten about it. I was merely entertaining myself with a bit of a walk, my husband being hard at work in nearby South Kilvington. With a little more foresight I could have chosen one of a number of walks, available through Thirsk Tourist Information. But, as often happens, I opted to follow my nose, in the rough direction of the town centre. At a mini roundabout I chose Stammergate over Long Street, and the gentle curve of St. James Green. A sign in the window, “If you want the best seat in the house- move the dog”, made me smile. I followed the dog walker down a narrow path and found myself on the banks of Cod Beck. The name derives from Cold Beck, a beck being smaller than a river, and it runs deep between the banks of the stream, so is always fairly cool. It flows from Cod Beck Reservoir at Osmotherley, on the edge of the North York Moors, for 22 miles, passing through the centre of Thirsk and finally joining with the River Swale. It’s unusual to find a young woman, fishing on her own. Not so unusual to find a small girl entranced by the tumbling waters of the weir. A signboard tells me that this area is known as The Holmes, where a grove of straight stemmed willows were once used for basket making. I turned back at the weir, heading for 15th century St. Mary’s Church, opposite The Marage, the site of a former fishpond and recreational area. 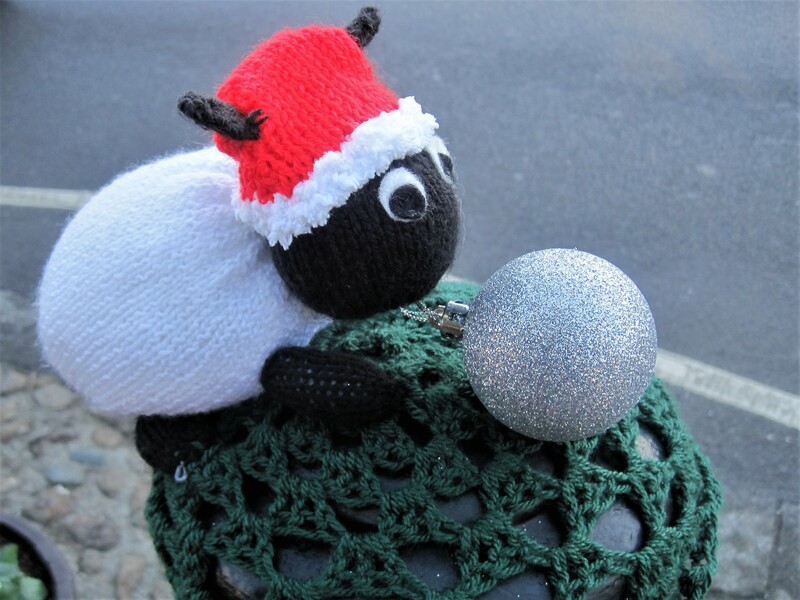 Unfortunately there was a service in progress in the church, so I turned into Kirkgate, discovering my first hint of yarn bombing at Thirsk Hall. Kirkgate is also home to the World of James Herriot. You may remember the TV series ‘All creatures great and small’, based on the books by James Herriot about the life of a vet in the Yorkshire Dales. Thomas Lord, founder of Lord’s Cricket Club in London, was born in 1755 in the house on Kirkgate that now houses Thirsk Museum. Thirsk is built around a large medieval market square, established in 1145, and the market continues to function every Monday and Saturday. 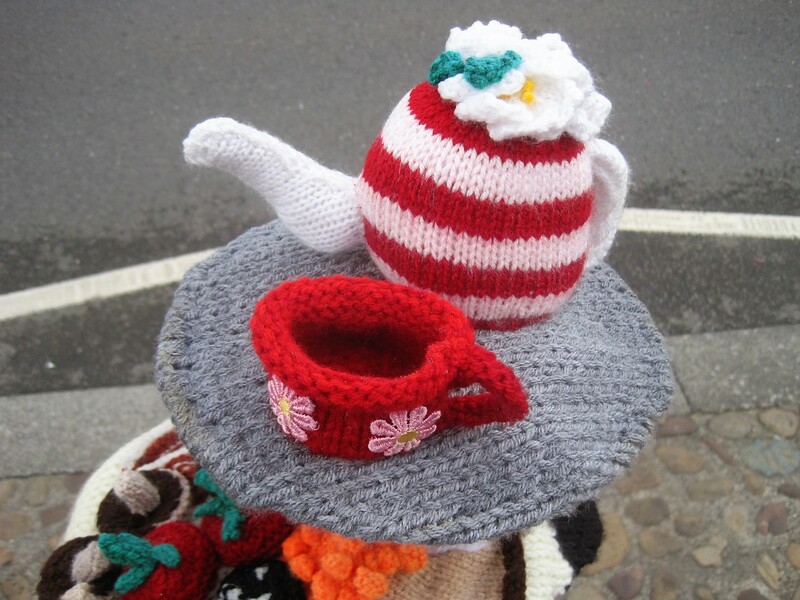 Today it’s enhanced by something warm and whimsical. Sit back and enjoy! Wonderful, aren’t they? I expect I’ve missed a few, but traffic and awkward angles didn’t help. The Tourist Information office is in Market Place, but closed on Sundays. I wandered round into Millgate and found myself surrounded by ducks as I admired the bridge. Once a corn mill was sited here, fed by a mill race and regulated by sluice gates. All that remains today is the weir we saw earlier. But inevitably I’m drawn back to Market Place. 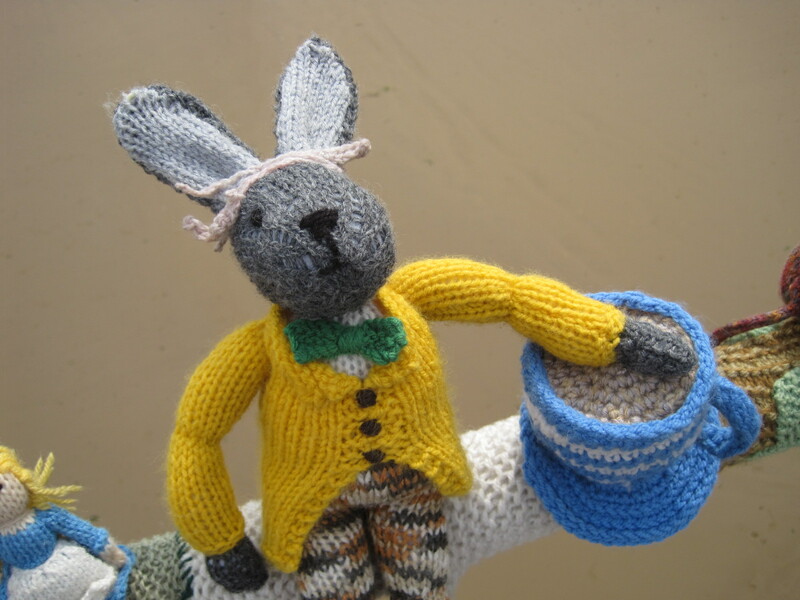 It’s time for a cuppa, don’t you think? It’s an interesting place and I hope you enjoyed our wander. 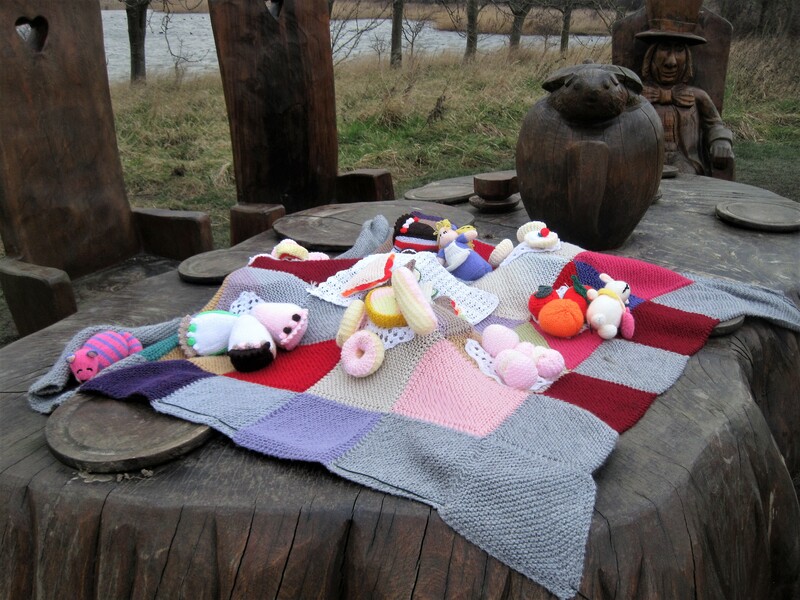 Do you have anywhere nearby where the yarn bombers have been busy? The first place I ever saw it was Hunstanton in Norfolk, but since then I’ve even seen it in the Algarve! 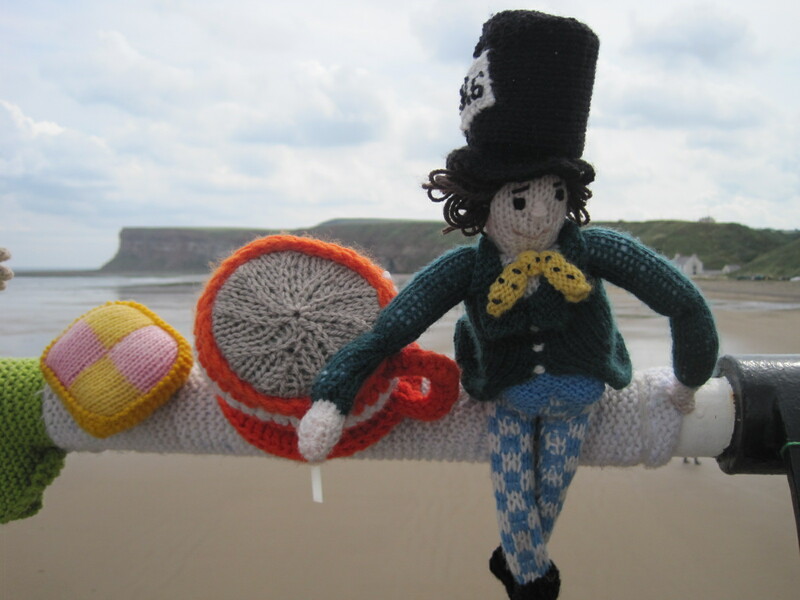 And, of course, my favourite little seaside town, Saltburn, dazzles every year. 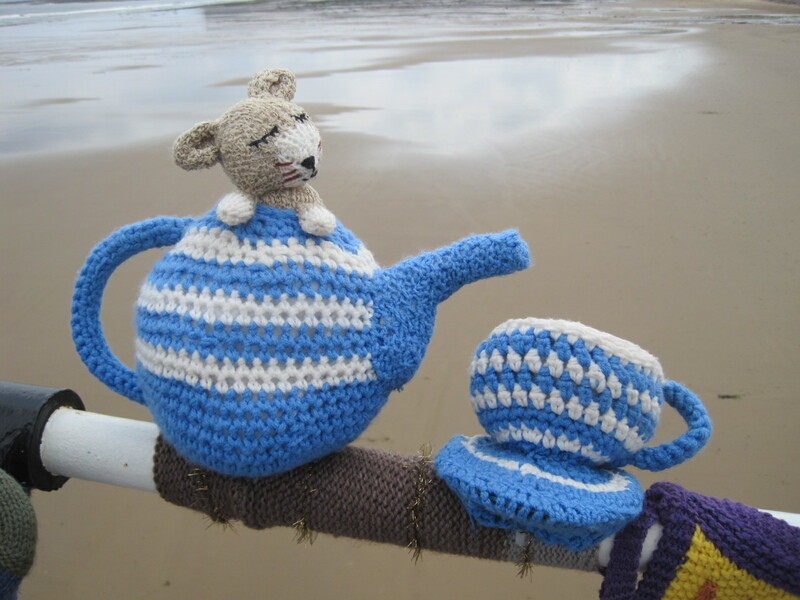 Let’s pop the kettle on now! Time for a read. Thanks, everybody! Once again I have some wonderful contributions. You never let me down. Please try to find time to visit these lovely people. You won’t be disappointed. And if you can join me next week, that’d be great too. 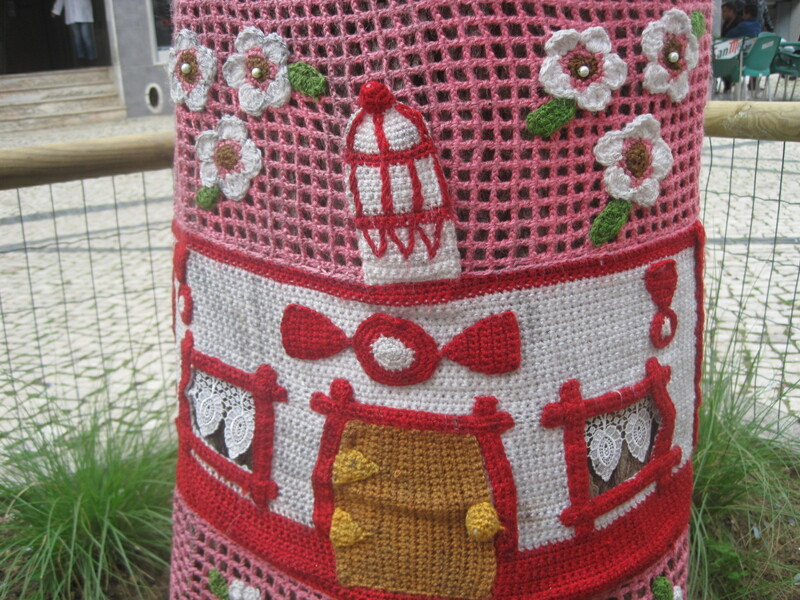 Details, as always, on my Jo’s Monday walk page. Absolutely my kind of walk! Hell, it certainly isn’t, Jude! And it’s heaven on the beach, with Meg this week. Wordlessly! Who’d have thought inland Australia could look like this? 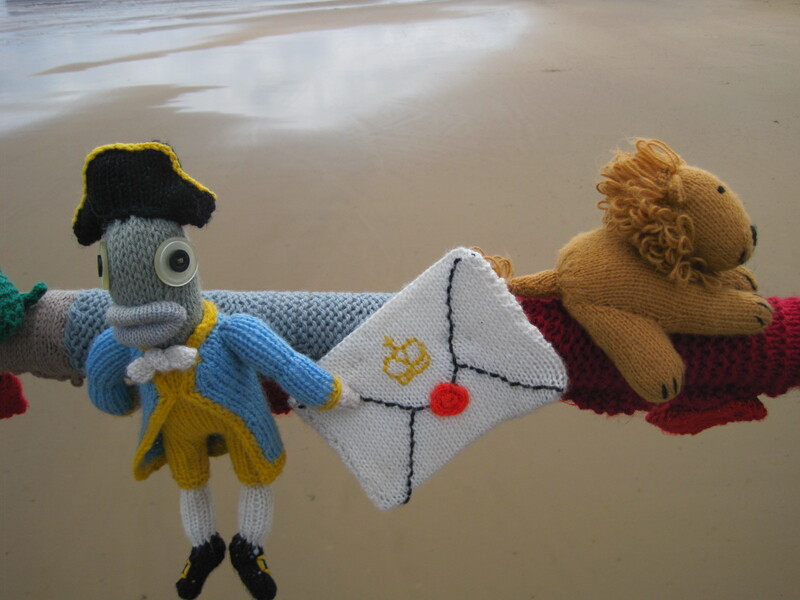 A truly fabulous post from Miriam! Jackie’s off on another jaunt! What is One of the Most Popular Destinations in California? And who hasn’t wanted to walk at least part of the Camino? Andrew, I hope you’re paying attention? Good luck to you, Jill! Liesbet gets into some strange places on this one! Some folks are a bit lazy when it comes to walking. Not you, Becky, of course! Another post from Northumberland, by David. And did you find that photo, Sue? Where’s Drake got to this week? Take a look! And finally, are there any better cities for walking in? Just ask Carol! That’s it for another week! I’m off up to Durham with the group this morning. Take care till next time! 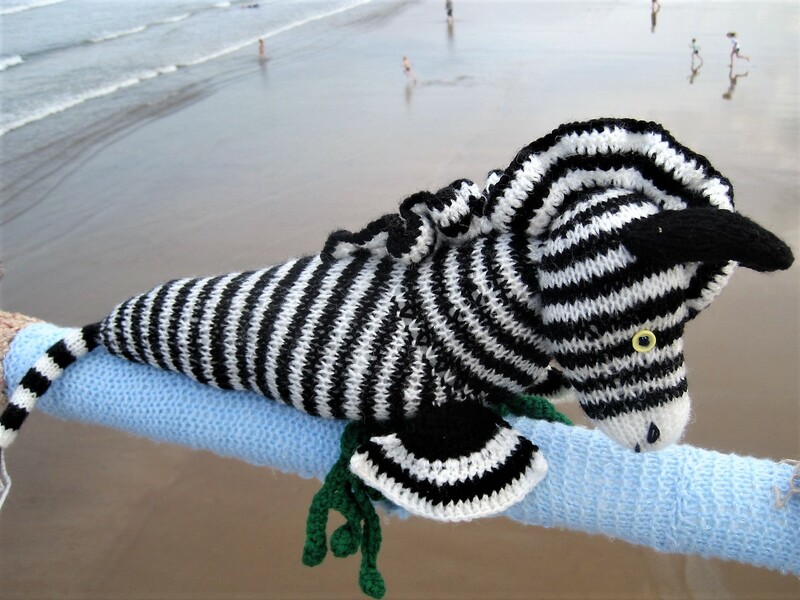 Very cute, our seahorse, isn’t he? 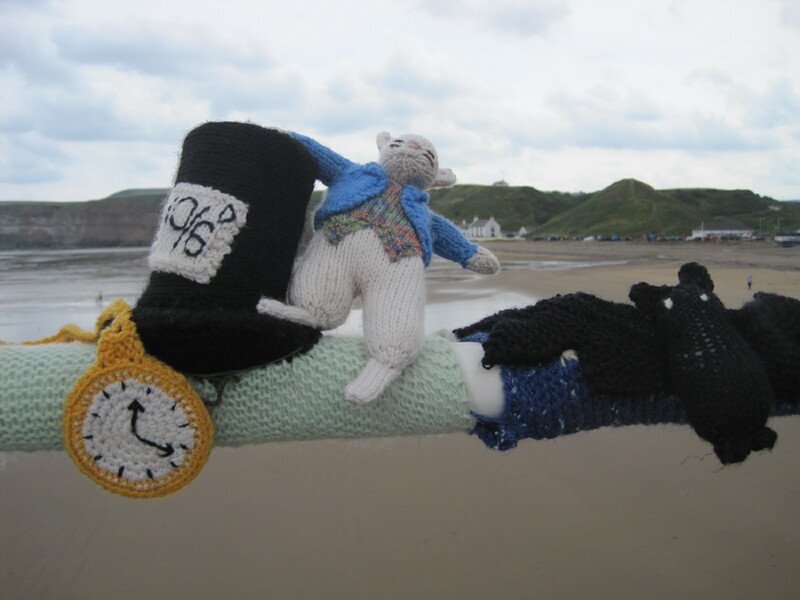 Yet again the good folks of Saltburn by the Sea have decorated their pier with yarn bombing. It’s a Summer tradition. Are they in good Order? I think I should let you be the judge of that. There are some wild hairdo’s, aren’t there? You can probably tell that there was a fresh breeze that day, but still lots of people. 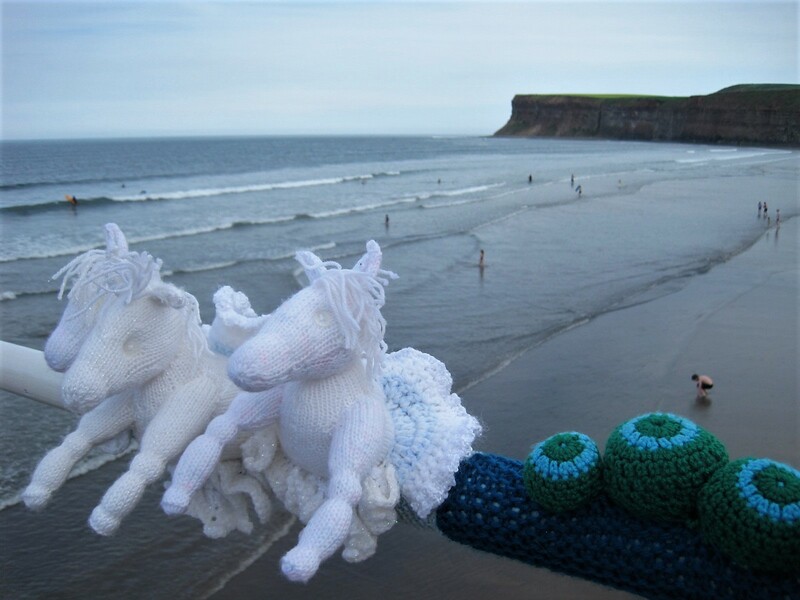 Let’s end with a bit of a gallop, down by the sea. Such skilled handiwork, as well as being completely adorable. That’s it for another year. The next day it simply poured, and has continued to do so. The shopaholics amongst you will adore Debbie’s Six Word Saturday this week. Me, I just want to go to Madrid! Wishing you a happy weekend! 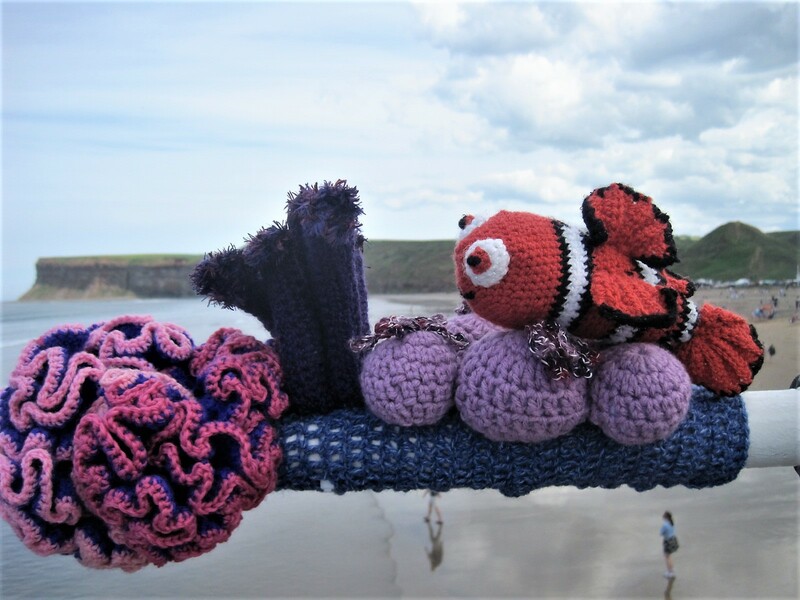 Strange place to find yarn bombing! 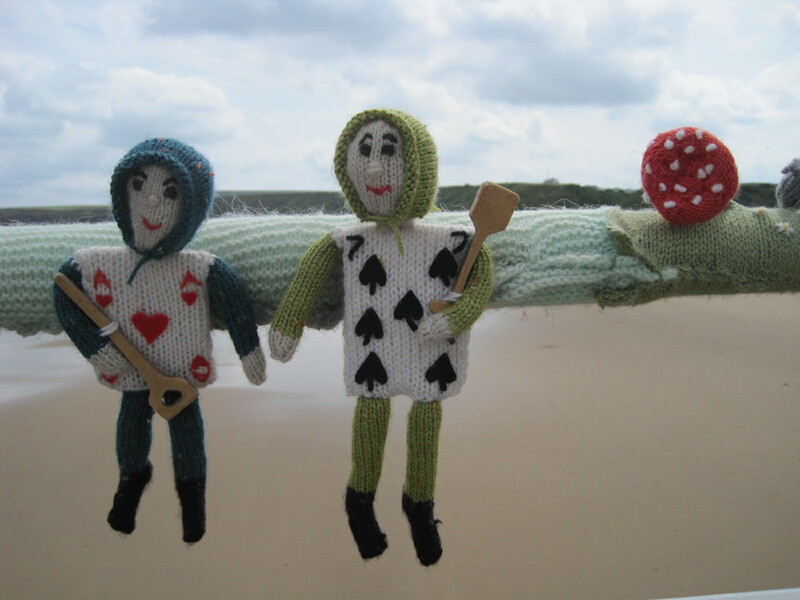 Being in Saltburn last week reminded me of an unexpected find on my recent trip to the Algarve. It was a grey and slightly surly day, with just a hint of sunshine, and I was strolling the seafront at Quarteira, seeking distraction. Near neighbours with Vilamoura and its extravagant bevy of yachts, Quarteira is a rather more ‘homely’ resort. Market day on Wednesday draws a crowd, and there are inevitably folk ‘taking the air’ on the long promenade. Efforts are being made to lure holiday makers further along the coast, with a new stretch of promenade and cafes beyond the small fishing harbour. Always nosy, I was wandering over to take a look when I spied these. They couldn’t fail to brighten up a grey day, could they? 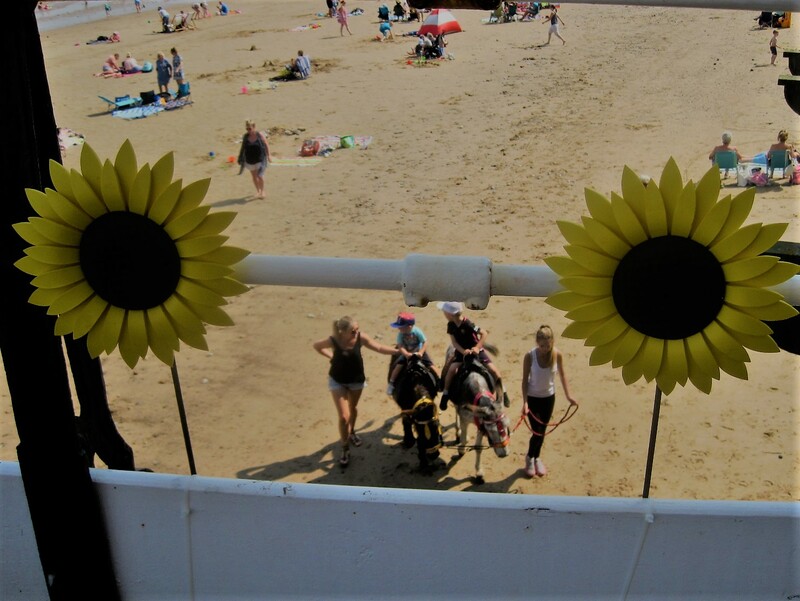 I’m quite looking forward to seeing if Saltburn brighten up their pier again this summer. 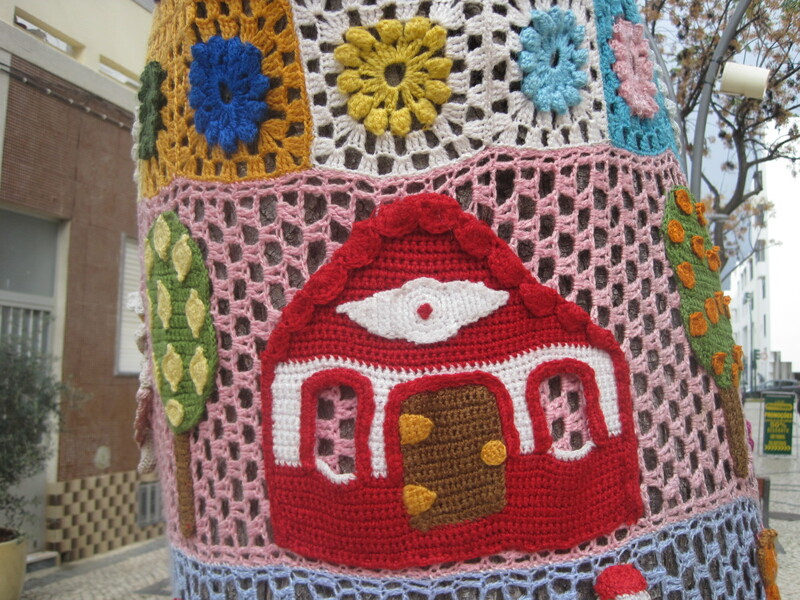 Do you remember last year’s yarn bombing? Hope you have a colourful weekend. Mine will be full of washing. I guess that’s colourful enough! Have fun, and maybe pop in and see Cate at Six Word Saturday. See you on Monday for another walk. 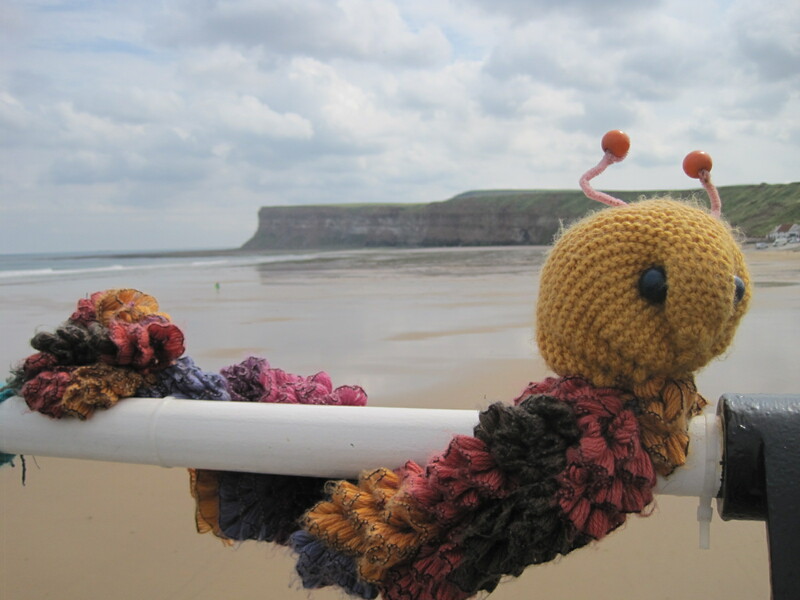 Just hanging about on Saltburn pier! I could have chosen a better day to visit Saltburn, but the sun was shining when I left home. 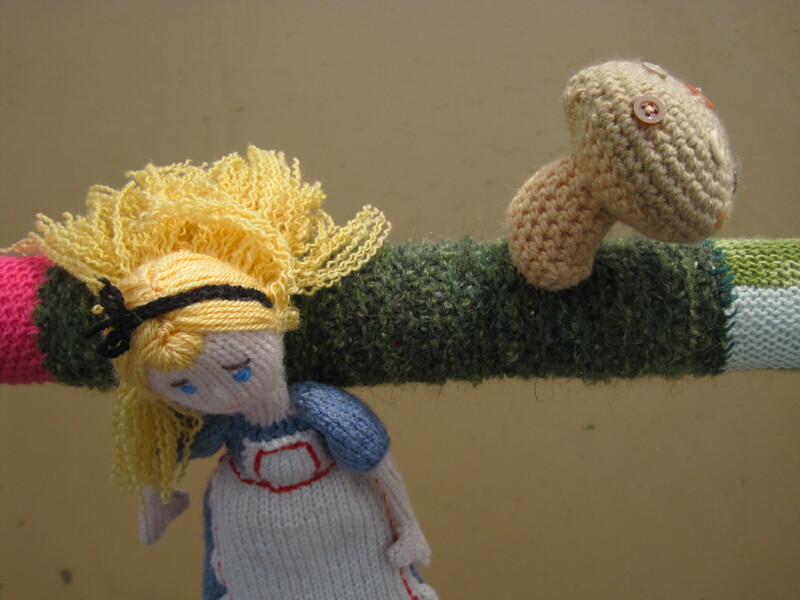 At least I didn’t have to elbow my way through the crowds, but the wind had Alice and her friends bobbing about a bit! Still good fun, though. See how many characters you can recognise? Of course, there was tea! Even a slice of Battenberg! So I had to enlist a hand! But at least there’s plenty of time! Not the Ugly Bug Ball! Don’t forget to click on the smaller photos for details! Ready to tackle the shell food! I’m feeling just a little cross! We’re just hangers on, dear! I had such fun playing with these guys! 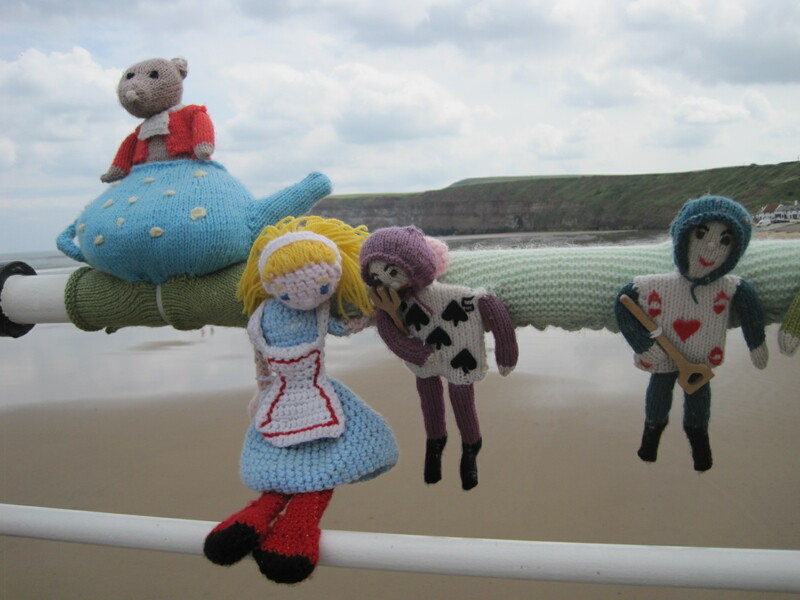 Each year Saltburn comes up trumps with its yarn bombing, whatever the weather. I hope you enjoyed it too. Thanks to Elaine for reminding me, because I almost forgot. Have a happy weekend, won’t you, and don’t forget to pop in on Cate at Show My Face with your ‘six’ words. See you Monday!